The four-star Oatlands Park Hotel is a historic country house hotel in the heart of Surrey. This hotel offers a terrace, multilingual staff, and is set in ten acres of magnificent gardens and parkland. The grounds were the site of a grand Tudor palace The current hotel was built on the footprint of a large mansion which burned down in the late 1700s, but dated back to the 15th century. Once known as the South Western Hotel, it hosted a number of world-famous guests including writer Emile Zola, novelist Anthony Trollope and artist and poet Edward Lear. The current owners bought the hotel in 1986 and have lovingly restored and refurbished it, retaining the unique character of the buildings and grounds. The hotel has 144 guestrooms which have been individually designed, offering unique character. The hotel has access to a 24-hour business center and meeting rooms. Event facilities measure 4,058 square feet (377 square meters). Elegant function rooms can accommodate between two and 400 delegates. Guests can take advantage of complimentary WiFi access. Whether you want to enjoy a stroll around the historic grounds of the hotel or enjoy the local attractions, Oatlands Park Hotel offers something for everyone. The hotel has an outdoor tennis court, and croquet on the lawn is available on request. There is also an indoor gym where guests can exercise whatever the weather. The Mulberry Restaurant reflects modern design and elegant style. Luxury furnishings and its own terrace make the Mulberry Restaurant the perfect place for a unique dining experience. A bar and lounge is on site where guests can unwind with a drink. 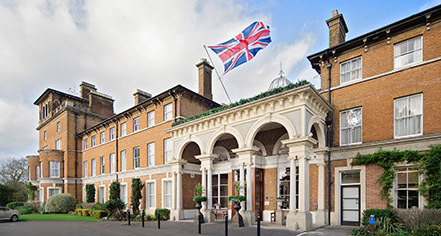 Oatlands Park Hotel, a member of Historic Hotels Worldwide since 2018, dates back to 1856. Hotel/Resort Fees & Taxes: Late check-out fee: GBP 40 (subject to availability). Payment: All forms of payment are accepted. Payment is required at time of booking. Visa, MasterCard, Amex, and JCB are accepted. 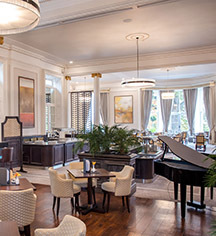 The four-star Oatlands Park Hotel is a historic country house hotel in the heart of Surrey. This hotel offers a terrace, multilingual staff, and is set in ten acres of magnificent gardens and parkland. Learn more about the History of Oatlands Park Hotel .